With Missouri’s primary elections today, perhaps one of the biggest issues on the ballot is Proposition A, in which voters will have the chance to amend the state constitution and make Missouri a “right-to-work” state. The vote will decide “whether the state should ban compulsory union fees in all private-sector workplaces” according to the New York Times. 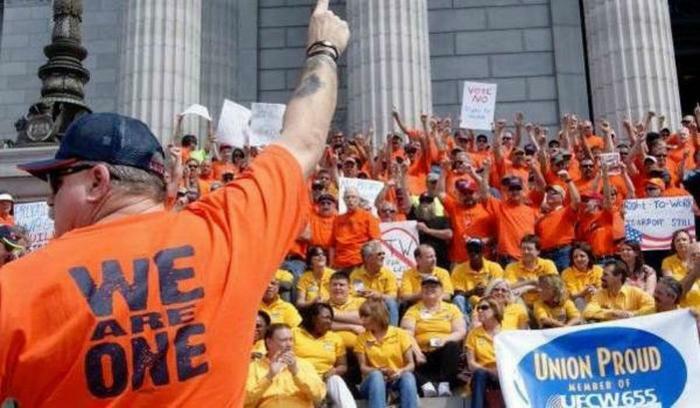 While a bill was passed and signed into law in 2017 that made Missouri a right-to-work state, thus prohibiting unions from requiring fees as a condition of employment, opponents received over 300,000 signatures on a petition preventing the law from going into effect. The law’s adversaries were adamant that a referendum decide the issue. Missouri would become the 28th state to adopt right-to-work, should Proposition A pass in today’s election. While advocates of the law believe it will attract more business, labor unions argue that it will weaken the collective power of workers. “Right now Missouri is missing out on opportunities for new jobs and new investments from companies that will only locate in right-to-work states,” said Ray McCarty, president and CEO of Associated Industries of Missouri. Back in June, the Supreme Court dealt a heavy blow to organized labor unions when it struck down an Illinois law that required non-union workers to pay “fair share fees” that go towards collective bargaining. Following that decision, labor backers and opponents have turned their attentions towards Missouri. According to Politico, the AP reports that “even though union members comprise just 8.7 percent of Missouri’s workforce last year,” $20 million has been spent on the ballot initiative. Last month, the Economic Policy Institute (EPI) projected that roughly 60,000 fewer Missouri residents would be covered by a union contract should voters approve right-to-work. Based on EPI’s research, the average worker in a right-to-work state makes 3.1 percent less on an hourly basis than in states without such a law.